The Conference of Peripheral and Maritime Regions (CPMR) sent a strong message to Regional Policy Commissioner Corina Creţu in favour of an effective post 2020 Cohesion Policy for all regions at a meeting on 30 May 2017. Enrico Rossi, President of Tuscany (IT) and Vice-President of the CPMR said: “We are going through challenging times with imbalances across Europe. A harmonious development across Europe’s regions remains extremely valid today”. Alain Rousset, President of Nouvelle-Aquitaine (FR) stressed the “fundamental and political role of Cohesion policy as the necessary bond between a reformed European project and its citizens”. Cees Loggen, Regional Minister of the Province of Noord-Holland (NL), underlined “The importance of European Territorial Cooperation programmes across European regions and with Europe’s neighbours, also in view of the imminent Brexit negotiation”. 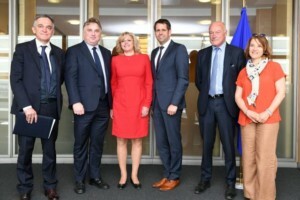 Olaf Lies, Minister of Economy, Labour and Transport of Lower Saxony (DE) emphasised “the role of Cohesion policy, as the EU main investment policy, which provides a long-term strategic vision for all of Europe’s regions”. All CPMR representatives reaffirmed the need to clarify the respective missions and objectives of the European Structural and Investment Funds and the European Fund for Strategic Investment, which is a key message arising from the CPMR policy principles on post 2020 Cohesion policy. Commissioner Creţu thanked the participants for the fruitful meeting, which forms part of a longstanding cooperation with the CPMR over the years. She stressed the role of Regions in delivering concrete results and communicating those largely so that Europe’s citizens recognise the policy’s effects. CPMR Regions informed the Commissioner of the importance for Regional Presidents to have an imminent meeting with the President of the European Commission Jean-Claude Juncker on building the European project of tomorrow with Cohesion policy at its heart.